and grazing of cattle round the year. The Ranch is a tourist delight as a result of its divergent attractions. There are a natural swimming pool, horse riding, beautiful waterfall to behold, gorilla camp, bird watching, sporting facilities and accommodation. 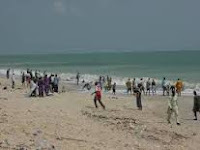 One of the numerous fine beaches in Nigeria is the Ibeno Beach in Akwa lbom State. A lover of water sport finds the Beach which stretches to James town on the Atlantic most inviting. River include its crystal-clear blue water; canoe rides; sandy beaches with such relaxation facilities as chairs and tables. At the beach also, BBQ grill are delicacies provided for picnickers. Arochukwu is a famous tourist destination with the cave of the famous long juju oracle as a particular attraction.The cave is believed to hold the long metal pipe through which the gods speak to the people. A traditional religionist would find the oracle quite an attraction. It is, first and foremost, a religious centre with a well-laid down administrative structure headed by a Chief Priest. 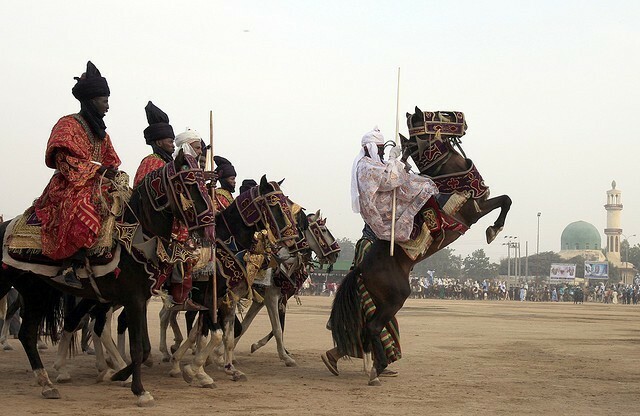 Yola is the capital of Adamawa State in the North Eastern part of the Country. The most striking impression about the town is its undulating topography of hill chains particularly the three sister hills which are so-called because they stand side by side and share the same height. 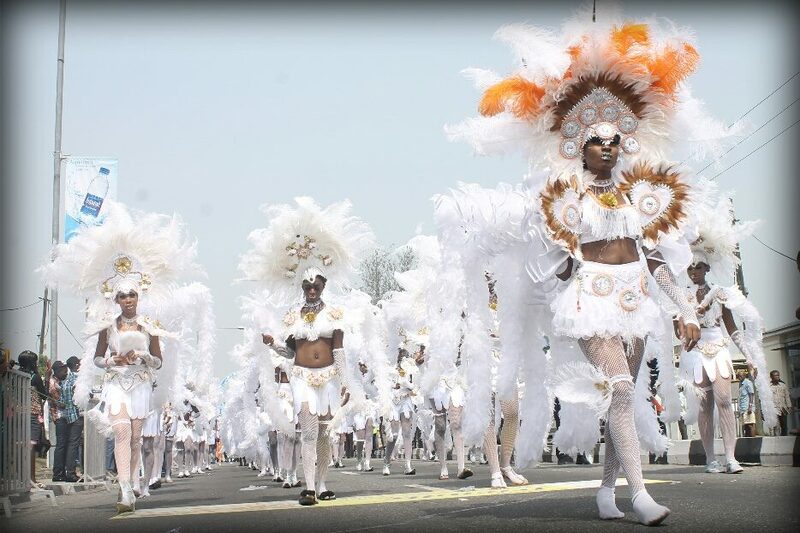 The cultural manifestations of the town get to their climax between the months of March and May when the city celebrates its fishing festival at lake Njuwa..
lgbo-Ukwu is an ancient town which has remained an attraction to tourists because of its bronze artifacts. The bronze which was first noticed in 1938 was later excavated by Thurstan Shaw, an English archaelogist. The bronzes which date back to about the 9th century are of high value because of their historic relevance. 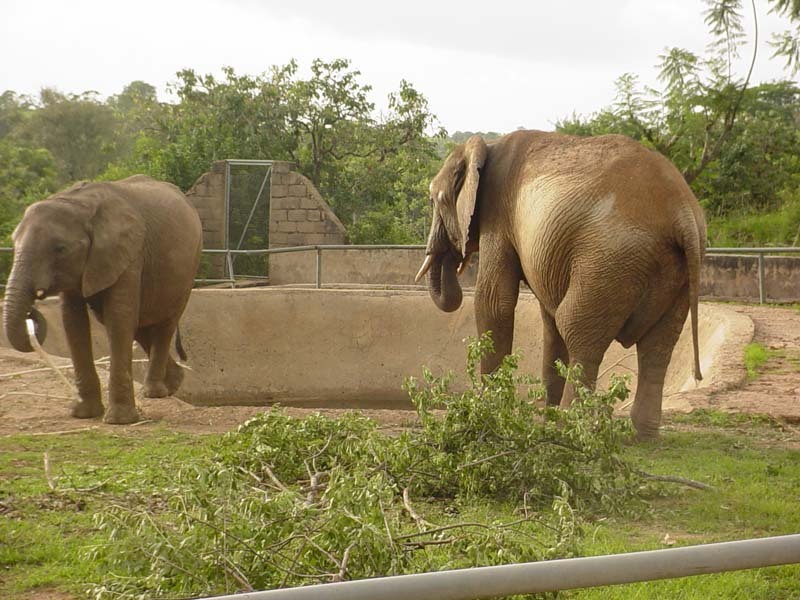 Yankari National Park has become the most developed Wildlife park in Nigeria with a lot of attractions for visitors. The park is famous for its variety of animals available for viewing round the year, though the animals are better watched between November and May period of the dry season when the animals converge around the Gaji River, Baboons, Waterbucks, Elephants, Crocodiles, Bushbucks, Duikers, Warthogs, Hippopotamus are among the anirnals commonly seen at the park. is a famous attraction in the Yankari National Park. It is particularly prized for its warm water. It is available both night and day for tourists who cherish swimming. The National Park is located in the South-Eastern area of Bauchi, the capital town of Bauchi State in the North-Eastern part of Nigeria. Located in the middle belt region of Nigeria, Benue State shares boundaries with Taraba State on the East; Plateau State on the North and Edo State on the West; and Anambra, Enugu, Cross River States on the South. The entire landmass presents hills of various shades and touristic appeals. lkyogen Hills exude mild weather condition which ensures steady green vegetation and a round- the-year grazing of animals in the areas which is also known as Ikyogen Cattle Ranch. Ushogbo Hills in Ushogbo town also offers clement weather condition that makes it most fulfilling spot for tourists and adventures. Bassa Hills, like the Ushogbo Hills, are worth visiting especially for their satisfying scenery; and Swern Hills are valued for their historical linkages. 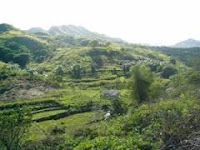 The hills are believed to be the place for origin of the Tiv people. 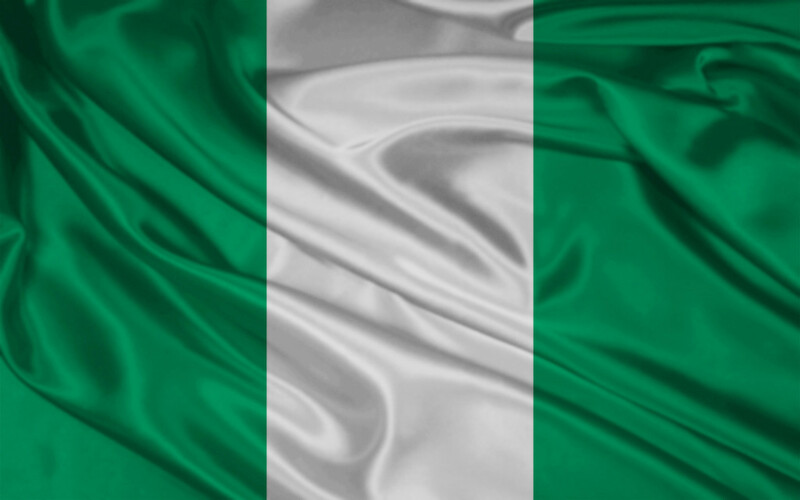 Lake Chad occupies a strategic location serving not only Borno State of Nigeria where it is located but serving also the three neighbouring countries of Niger, Cameroon, and Chad. The lake, apart from serving the agricultural and economic needs of the people, attracts a great number of tourists. Of paramount interest to tourists is the boating opportunity and visits to the numerous fishing villages in the area. 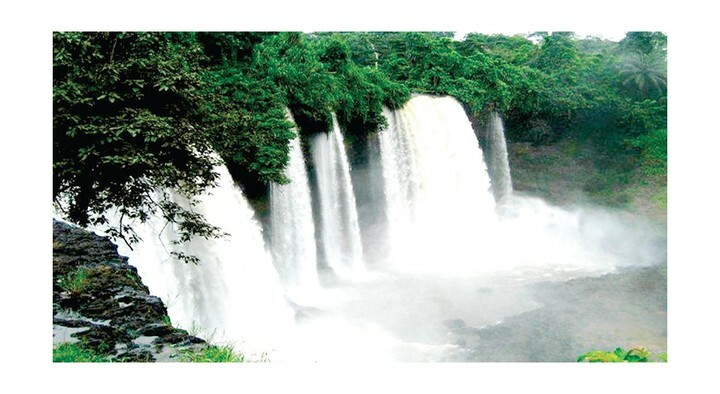 Some short distance away from the Nigeria-Cameroon border is the very captivating sight called Agbokim Waterfalls. 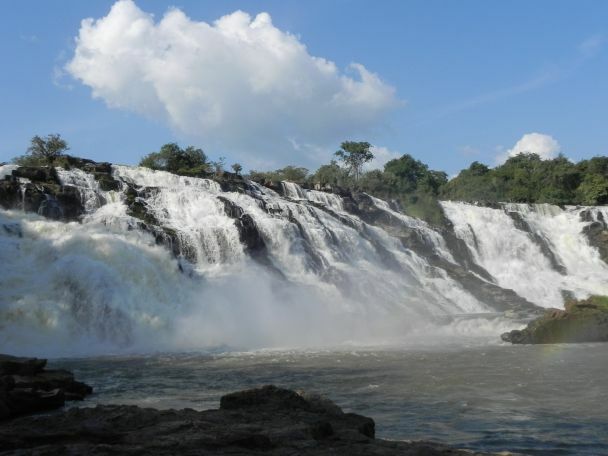 The Falls situated in Cross River State lies less than 30km from Ikom and is highly recommended for picnics. The falls are pleasantly surrounded by green vegetation. Near the Nkpologu campus of the Enugu State University of Science and Technology (ESUT) is found this very important mineral deposit. The hill which is more than 300 metres above sea level and almost half a kilometre long has silica, an important raw material fofthe manufacture of glasses. The surrounding environment is very captivating with hills, valleys and plaips beautifully wrapped up such that one cannot ignore it's breath-taking views and awe-inspiring blend. The home of Mbari sculptural houses. These sculptures are robust art manifestations of the prevalent social life and a monumental art sacrifice to "ALA" the earth goodness. In Mbari, Imo State there are very many objects like the terrorising beast, the plastic forms of symbols of the prevalent deities among which is the "ALA" herself, the Amadioha (Thunder god), the Ogwugwu (forest god) each deity with his or her mystical messengers such as snakes, monkeys, rams, tortoise and owl are properly represented. A number of symbolic models were sculptured or painted. These sculptures reflect the lgbo aesthetics. The Mbari Cultural Centre is an open air museum and found in Ikenegbu layout Owerri and at Eke-Nguru in Aboh Mbaise. 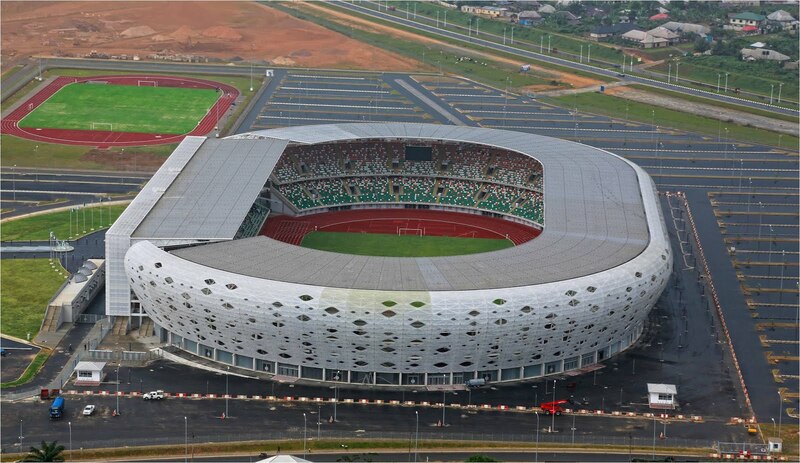 The holiday complex situates in Oguta local government Area of Imo State about 40km (forty kilometres) away from Owerri, the Capital of Imo State. 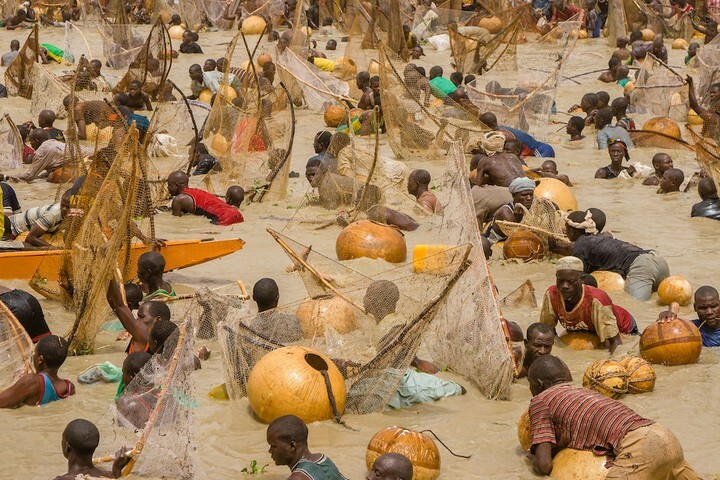 The lake is qf fresh water and the second largest natural lake in thecountry after lake Chad. To complement the complex water-based recreation services, there are other interesting attractions to watch. Birnin Kudu town lies in the South of Jigawa State. Birnin Kudu is noted for the presence of rocks. Fascinating are the ancient paintings on these rocks. The different paintings are eloquent information on the styles of the early settlers in the area. A trip to the Nok Village in Kaduna State launches visitors into physical romance with the so-much-talked-about culture of the Nok people. The cultures has been known for over 2,500 years. The Nok culture is better appreciated appraising the excavations made by the numerous scholars and research. Terra cotta, heads of animals and man; and weapons of war are abundant on display. Chief Nana Olomu was a powerful nineteenth Century indigenous entrepreneur. As a reflection of the grandeur of his achievements, he built this mag nificent edifice at the turn of the century. It houses his personal effects and evidence of his contact with the Queen, administrators and traders of the British Empire. Located at Koko in Warri -North Local Government Area of Delta State, the Palace has now become recognised and approved as a National Monument. A copy of the Holy Bible is believed to have descended miraculously in Araya in Delta State from heaven around August, 1914. The spot now attracts Christian Pilgrims from all over the country, especially during the Easter season. Located in the quiet University Town of Abraka, this Motel is ideal for those who want to escape the noise and tension of city/urban life. Hence guests can swim, boat, sport-fish\or simply bask in the warm sun.on the exquisite sand-beach as the glass- clear Ethiope River flows lazily by. There are also lawn tennis, squash rackets and badminton courts as well as a children's playground. The Okomu Wildlife Sanctuary, Benin City, Edo State was the first in the country to be protected by law for conservation in August 1985. It is jointly managed by the Edo State Government and the Nigerian Conservation Foundation, (NCF). The sanctuary contains rare species like the white-throat- ed monkey. Also present are the mona monkey, the putty nosed quenon, the red-cangaby, chimpanzees, elephants, bush-baby, the potto buffalo, red river hog, duikers, horn bills, porcupines, etc. 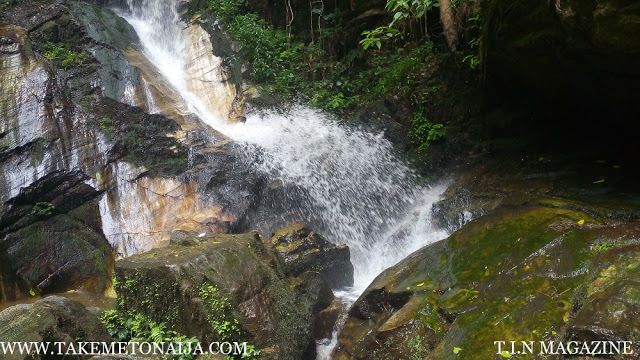 TheOkomu Forest Reserve is the second largest in the country after theOban Forests in Cross River State. Ososo town, on the boundary between Edo and Kogi States, is hilly and rocky. It lies about 40 kilometres from Igarra and 200 kilometres from Benin city in Edo State, The rocks and hills present a beau tiful scenery. There is a non-catering Rest House on top of a hill at Ososo, which grants a wide view of parts of Kogi State to as far as the Niger. From the Rest House can be seen some distance away a crater take with colourful fishes. An amusement park is being developed as part of the resort which has tem- perate weather for long periods in the year. 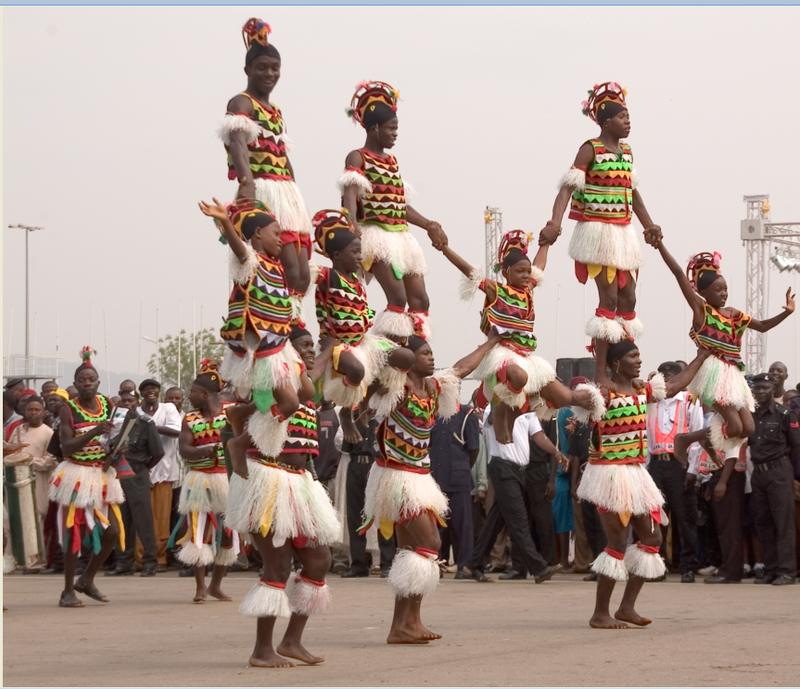 A half-hour drive from the burstling capital city of Enugu State is the Ezeagu Tourist Complex. The complex exhibits one of the natural wonders of wonders of nature. Measuring about 22 hectares in size, it comprises a lake, a cave and a waterfall (spring water). Its splendour is expressed by the almost 5 kilome tres long Obinofia cave whose sheer size and compartments is awe-striking. The surrounding scape is a marriage of various land forms with unique weather condition and exo- tic vegetation. The cave has several tunnels branching out in different directions. Some of the tunnels are inter-connected, often opening up into largechambers which are two to three high and up to ten metres wide. The Iron of Liberty: Lokoja, because of its location near the banks of River Niger, was an important centre for slave trade during the era of slavery in Nigeria. Also because if its strategic location, Lokoja aroused a great deal of interest in the European explorers and missionaries in the early 19th century, and it soon became a commercial post for European merchants and missionaries. Hence, when the British Government started to wage war against slave trade, Lokoja became a collection centre for slaves seized from slave merchants to be consequently set free. The spot where such slaves were freed was marked with a piece of iron pole now referred to as the "Iron of Liberty". This crusade was championed by the late Bishop Samuel Ajayi Crowther. 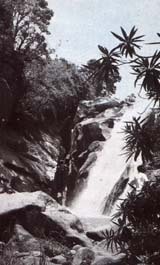 The Owu Waterfall is at Owa Kajola, lfelodun Local Government Area of Kwara State. It is about 120m above water level. The surrounding is evergreen while the waters are ice cold. Pategi Kwara State is located along River Niger and enjoys a bounteous stretch of sandy beach currently used by local fishermen. The Regatta pavilion is constructed on the beach and, together with the recently constructed regatta complex, Pategi beach has potentials for great holiday resorts. The beach is within the Maiyegun Tourism Zone of Eti Osa Local Government Area of Lagos State. The Beach is popular for relaxation spree. The beach hosts the popular Lekki Sunsplash Musical Concert. A project to develop about 9000 square hectares of land around the beach when completed will transform the beach into a modern resort of international standard. Relics of the slave trade comprising shackles, locks are in the custody of the Mobee family at Marina Badagry. A shrine in Badagry where Richard Landerwas tried before a priest for alleged espionage charges. He survived after drinking concoction as proof of his innocence. First of pair of Sato Drums: In Badagry are the first pair of Sato drums brought to Akara Kunmo in 1543 by Tosavi and Whensu his son, from Dahomey (now Republic of Benin). A high brow architectural masterpiece of modern bearing, the National Theatre is popularly acclaimed the cultural headquarters of Nigeria. Located along Kaduna Abuja highway, Niger State. This is a beautiful, giant of a rock used for defensive purposes by the Gwari natives against invading neighbouring tribes during the inter tribal wars. This rock is believed to posses certain powers which rendered enemies powerless and provided the natives with a good hiding places. 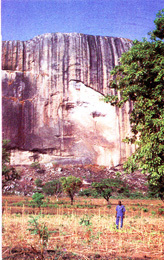 As the tourists nets closer, a human like face becomes Visible with engraving representing the sockets, the nose and the mouth on the side of the rock that faces Abuja road. Zuma rock represents a beautiful and unique natural work of rock formation. 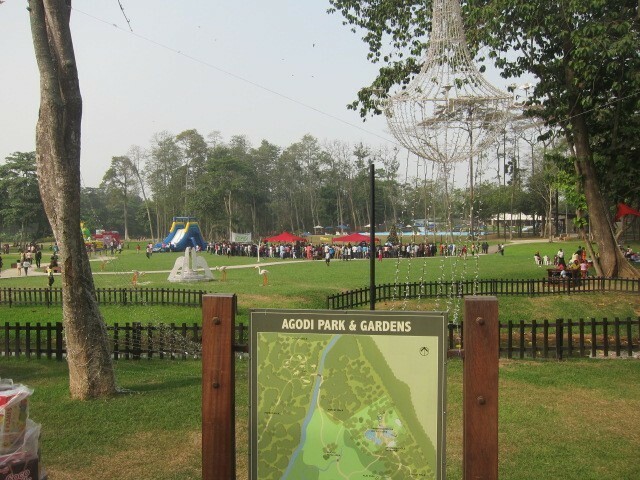 It offers a good environment for picnicking and relaxtion. The rock is about 107 km from Minna. Established in 1951 by late Mr. Micheal Cardew, a British porter of international repute. The centre in Niger trains native traditional porters in the art of modern pottery making in order to preserve and protect Nigeria's rich cultural heritage through the art of pottery making. This wonderful falls which is best described as Nigeria's Premier falls is located at kilometre 76 along Minna Suleja roads. From Suleja to the junction is about 45 kms while from the junction to the falls is about 2 kms. Brought to Bida from Babah during the reign of the late Etsu Nupe Usman Zaki, popular Brass works are found at Gbongbofu, Tswatako and Tswata Mukun area of Bida town in Niger State. The process is almost same as blacksmithing, except that the raw material is placed in a special basing which is also put over fire made by the blowing of bellows. The brass which is the raw material, melts after being heated for some minutes. The molten brass is later beaten into required shapes and sizes over an anvil.The products are mainly used for decoration, storage and cooking. For tourist/visitors souvenirs are available in the form of earnings, bangles,rings,trays,plates,walking sticks, brass toys etc. Birikisu Sungbo Shrine, a popular tourist centre in Ogun State is located at Oke Eri near Ijebu Ode, off the ijebu-ode/ibadan road in the Ijebu Ode Local Government area. The Shrine lies, less than 125 Kilometres from Abeokuta the Ogun State capital, 50 kils, from Ibadan the Oyo State capital and some 100 kilos from Lagos.It could be reached by motor vehicle through Motorable roads . There is a sign on the lbadan/ljebu main road which proclaims "Ogun State Tourist Centre Birikisu'", Here one turns off to reach the shrine. Birikisu Sungbo was otherwise regarded as the Biblical Queen of Sheba .Hear tomb the shrine is fast becoming the "Mecca" of Nigeria. For every year at all Moslem festivals, religious groups, of the Moslem faith converge at the shrine to offer prayers and seek. the favour of the spirit of the devout woman. The great attention that Birikisu still commands,derives from the belief that whoever visits her shrine and asks for anything in sober reflectfon will have his request met. 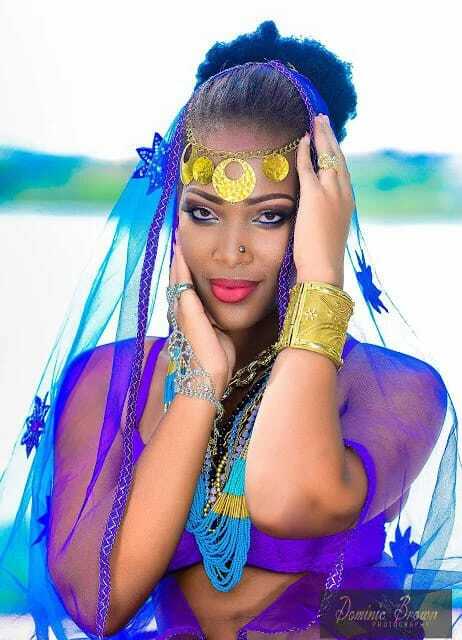 The Birikisu of romance was said to be the iblicalQueen of Sheba.She was an Arab. 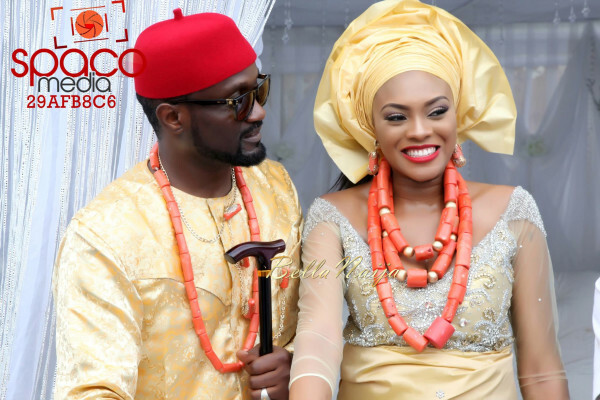 She was said to have met King Solomon with whom she fell in love, and became one of his numerous wives. Later, the Queen of Sheba in her age returned to Oke-Eri where she died and was buried. 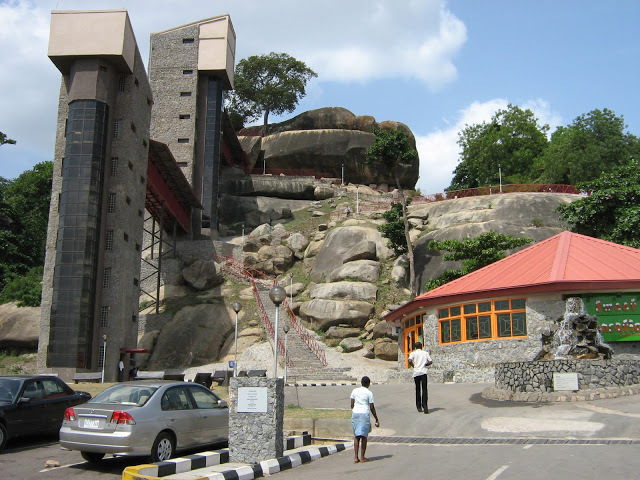 Olumo Rock is a massive outcrop of granite rocks of primitive formation from which Abeokuta (meaning under the rock )the capital of Ogun State derive its name. 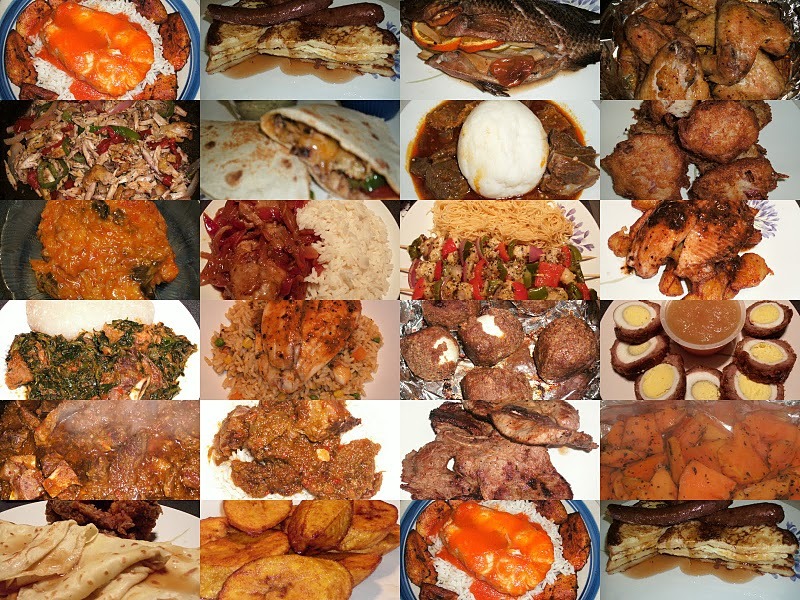 Abeokuta lies South West of the Republic of Nigeria and is 100 kilometres from Lagos . To the North some 70 kilometres away is the city of Ibadan the capital of Oyo State. The climate is hot and humid with an annual rainfall of 47 inches. The Rock is sacred to the Egba of Abeokuta because it was the place where they found refuge from their attackers te the days of internecine wars. By l83O, the main body of the Egba has already settled at the site of theOlumo and the refuge provided by the rock marked the end of their wonderings and struggles for existence. From that time onwards they have regarded Olumo Rock as their protection shrine and so made annual sacrifice to its deity. The importance of Olumo Rock to the Egba is conveyed in the assertion that Abeokuta was the gift of the Olumo, as Egypt was the gift of the Nile. To the Egbas, Olumo Rock stands not only as a monument of faith in unity but also a source of strength and unfailing protection and sustenance from the supreme being who led their ancestors through the perplexities of life safely to Abeokuta. Hence the interpretation of Olumo meaning "Oluwa fi mo" "God has put and end to our wanderings" Officially known as AT3, Olumo Rock is located off Alatise between lkija and Ikereku neighbourhoods of the town. The highest point of Olumo is about 137 metres above sea levels. Looking from the top one would appreciate the wisdom of the first settlers to have chosen such a perfect bulwark against external invasion. 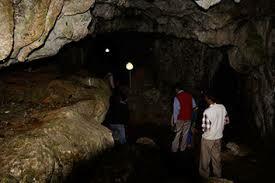 The name 'Olumo, meaning God built if derives from the fact that rock is naturally surrounded by caves. One of which is about twenty feet long and twenty five feet wide. This has slab like stones which appear to serve as seats used by the ancient dwellers. It probably was used as a hall of conference room. Another cave, some twenty metres long and seventy metres wide appears to be actual dwelling place.It has five built in rooms with a long corridor used as sitting room, kitchen and store. At the east end of it is another bug cave, Out with mud walls in outer and inner chambers. This is used as a shrine by the devotees of Orise lgun (God of Longevity). Ikogosi warm spring is about fifty-five kilometres from Akure, the state capital of Ondo State. Ikogosi is located in Ekiti West Local Government Area. The warm spring roll down over a hilly landscape. From another hill rises a cold spring which Joins the warm spring at a confluence. Together they form a continuous stream.The whole landscape with its green vegetation is fascinating. 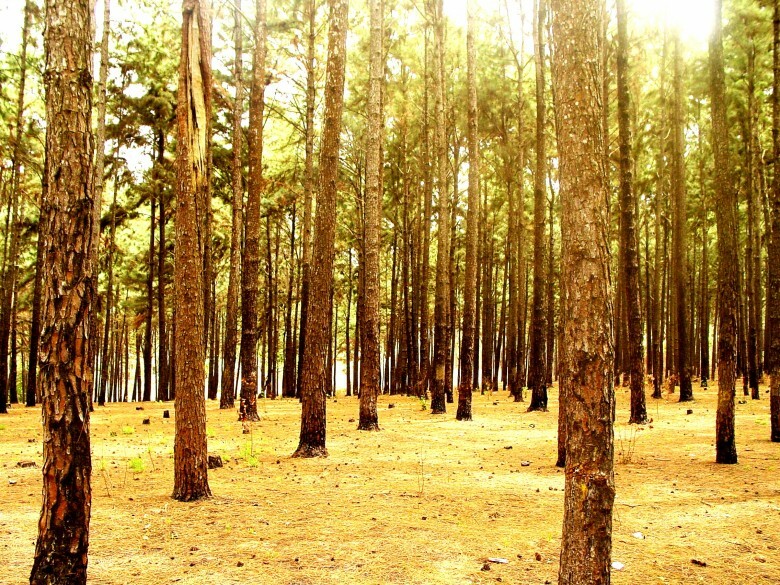 The immediate surrounding of the spring reveals tall evergreen trees, forming a canopy under which visitors can relax. The vegetation also checks erosion. The spring is said to have some therapeutic effects on some diseases like rheumatism and guinea worm. The undulating topography enhances the aesthetic beauty of the people of Ikogosi. The most scientific plausibility, however, is that the deeper a body of water goes underground, the hotter it becomes and if by chance it is forced back to the surface through some earth faults, the temperative becomes relatively high. 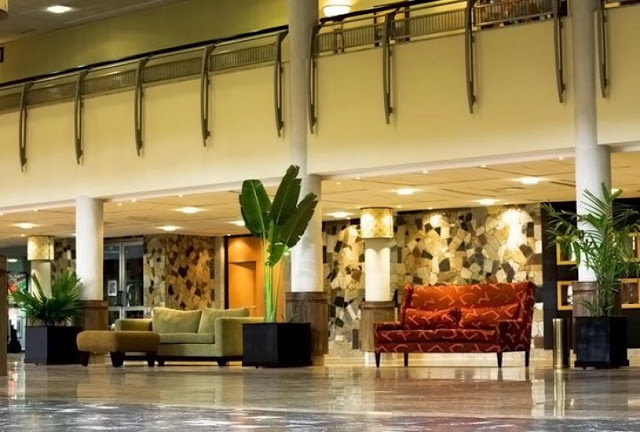 In an effort to make suitable arrangements for the comfort of guests, well furnished chalets have been constructed to meet the needs of the tourists.In addition, there are facilities for conference, seminars and catering services. These are apart from a Zoological Garden which is being developed. The provision of sporting and gaming facilities such as an enlarged swimming pool, tennis courts, table tennis and a golf course are being planned. Coupled with these is the rehabilitation of roads linking the centre with the major towns in the state. The historic Idanre Hills, situated in Idanre town about 20 kilometres from Akure, is in Idanre/lfedore Local Government Area of Ondo State. Towering into the sky and shimmering in the morning sun, make them beautiful tourist attractions. Idanre with the seeminigy impregnable hills looks like art ancient castle. The top of one of these hills with the six hundred steps which must be climbed before tourists can appreciate the work and beauty. Aiyetoro is a coastal town located about 160km south of Akure, and KMkm East of Lagos. The inhabitants of the town consist mainly of llajes. Owing to constant persecution and bitter disputes with their neighbours, they decided in 1945 to try a new communal way of life under the leadership of Philip Eretan and formed the Holy Apostles Community. This resulted in the practice of communal ownership of property. The aims of the community include the achievement of self sufficiency in production and religious freedom. 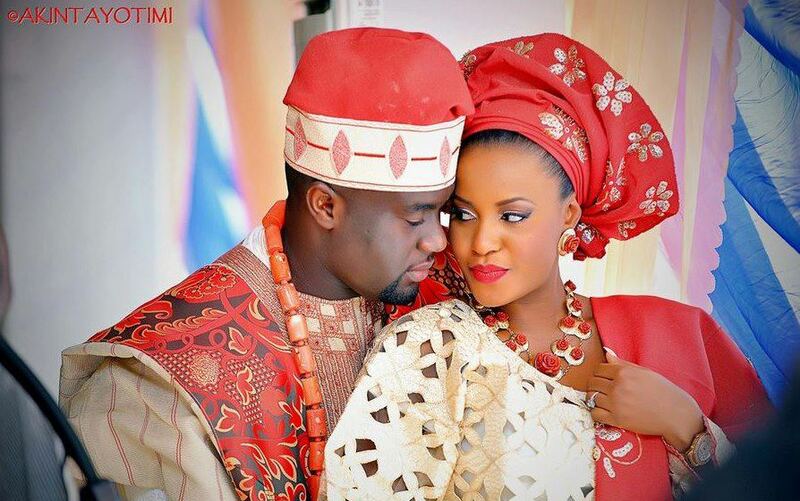 The adoption of a Yoruba name "Aiyetoro" depicts the mode of their living: "The world at peace". The Oba is the highest person in the Community.He is the Chief Priest and presides over all meetings. The Community docs not observe any public holiday or any day as special; instead, services are held every evening to which no outsider is admitted. All proceedings of the previous day are made known at such services. The whole Community is run as a cooperative enterprise. Schools, Colleges, Ships and Trawlers, a power station, a sawmill, houses, a bakery, a shoe industry and a dress making industry are some of the many establishments jointly owned by the Community. Everybody is employed in one form or the other. It is obligatory for one to work or leave the Community, for failing to do so. Aiyetoro like other coastal towns, is swampy, hence the houses are built on poles and cannot be reached by road. Visitors are taken to the community by speed boats which take off at lgbokoda, near Okitipupa. A reception hall and rest houses are provided by the Community for the benefit of visitors. It could be rightly claimed that this is the only Nigerian Community which does not experience power failure or theft. Smoking is, however prohibited and the people have lived together since and are countented with life for the past 30 years. Life in the community is the arch type of the dream world, a paradise on earth. A visit to the community offers very exciting and interesting experience in the powerful speed boat which takes one to "The World at Peace". The Osun Shrine represents an eloquent statement on the traditional religions of the people of Osogbo. Situated on the bank of Osun River, the shrine remains an attraction any day; the numeracy of Yoruba gods are represented. The ancient town of lfe in Osun State is to the Yoruba race, what Daura is to the Hausa people. 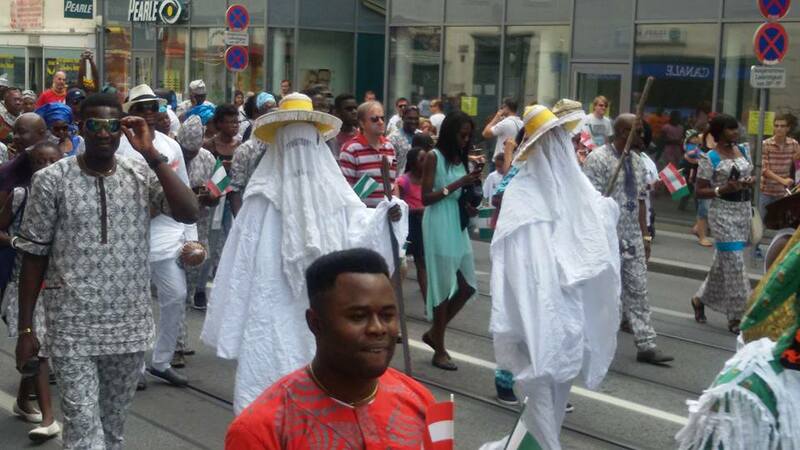 It is reverred as the cradle of the Yoruba race. 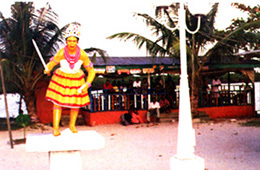 Popular legend among the Yoruba people is that creation started in lle-ife town. They all trace their ancestry to the ancient town. 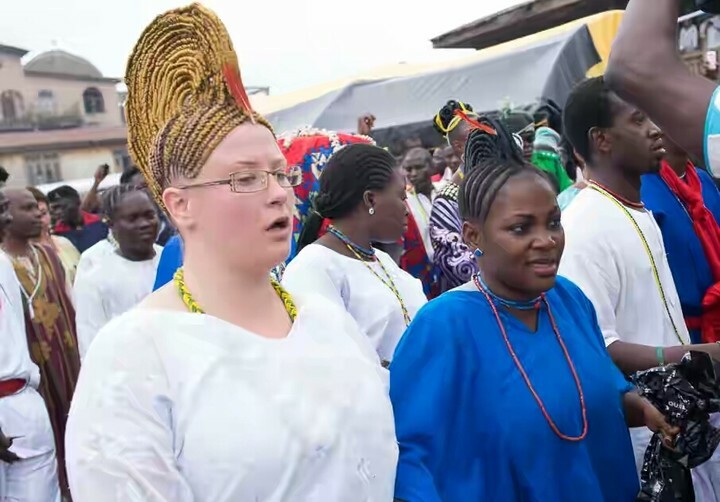 The Ooni is the traditional ruler of the lle ife town. His palace, considering her rich relics, has been designated by the State as ahistorical monument. lfe Museum: The establishment of the lfe musuern is traced to Ooni Adesoji Aderemi. Now under the management of National Monuments, the lfe musuern is appreciated for its numerous archaelogical artifacts. In lfe, one object of attraction is Opa Oranmiyan (Oranmiyan's Staff). Oranmiyan, the 3rd Ooni of lfe is said to have owned the staff which is 5 metres high and about 11/2 metres at its base. Made of stone, the staff has spikes and nails piercing menacingly from it. It is believed that the staff was used by Oranmiyan as a weapon against enemies. The Obafemi Awolowo University museum along Old lkirun Road is yet another attraction in lfe. lbadan, the State capital of Oyo State is the largest indigenous city south of Sahara with a population of over 3 million. It was founded in 1830 by Lagelu. The city was formerly called "Eba Odan" which literally means "by the grassland" but with usage and time the name became lbadan as it is known today. Although, lbadan is the commercial, industrial and cultural nerve centre of Oyo State, it still retains much of the characteristic of a typical African city. Its development has followed the pattern of grouping family houses into compounds which Is the feature akin to all ancient towns in the State. Its skyline is a broad expanse of corrugated iron sheets turned brown by the weather and age, broken intermitently by modern edifices of Cocoa House, Finance Building, Glass House, Agbowo Shopping Complex, Premier Hotel, Cultural Centre, Lekan Salami Sports Centre, University of lbadan, the U.C.H., the Parliament Building among others. The city is well connected by road, rail and air routes to parts of the states, the country and outside world. It is an ideal centre for exploring other towns which include Ogbomoso, Oyo, lseyin-lgbeti, lgboho, Saki, Okeho, Iganna, lgboora, Eruwa etc. 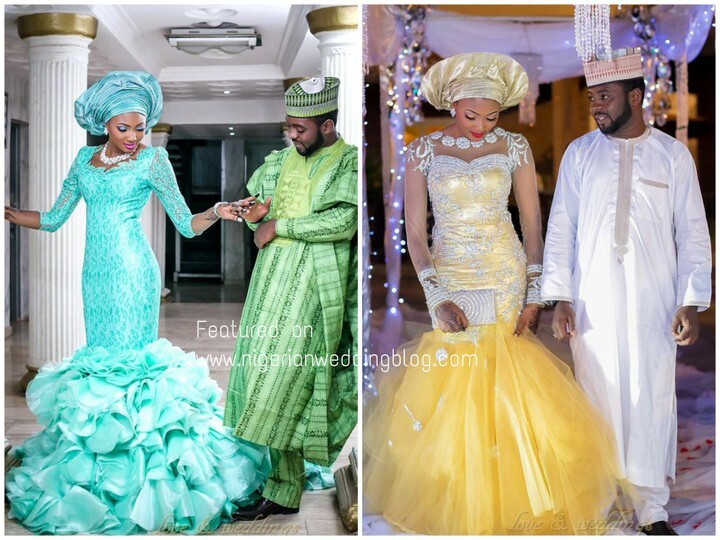 It is located 61 kilometres from Jos Akwanga road in Barkin Ladi Local Government Areaof Plateau State . It is a crowd pulling weekend pinic resort surrounded by beautiful rocks and trees. The overlooking viewpoint of the falls is also a frequent location for television soaps, film and various commercial productions like T.V adverts, Calendars, Post cards, Posters etc. 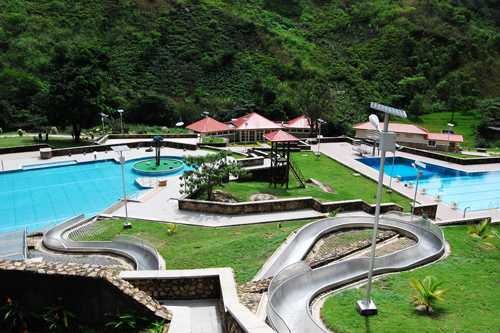 Tourist can engage in swimming, rock climbing , picnicking, etc, in a peaceful natural and adventurous environment. Thatched round huts are available for relaxation. Bar services are also available. 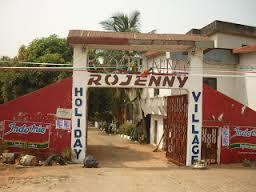 Located in the outskirts of Wase town about 216 kilometres South-East of Jos. Available records indicate that this beautiful massive dome shaped rocky inselberg is one out of the only five in the world. One of the very few breeding places for White pelican birds in Africa. The remarkable rock which rises abruptly to 350 metres above the plain of Wase town is a centre of attraction for curious geographers, geologists, mountaineers, and bird watchers. 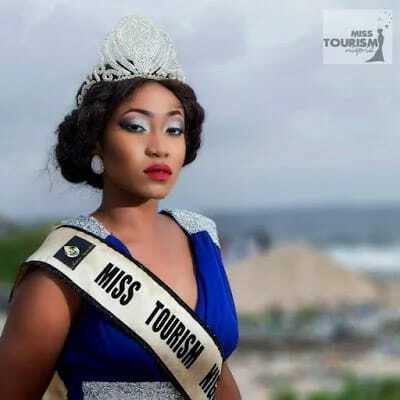 Located on an artificial sand beach along Kolabi Creek, is one of the waterfront tourist resorts in Port Harcourt the Capital City of Rivers State. 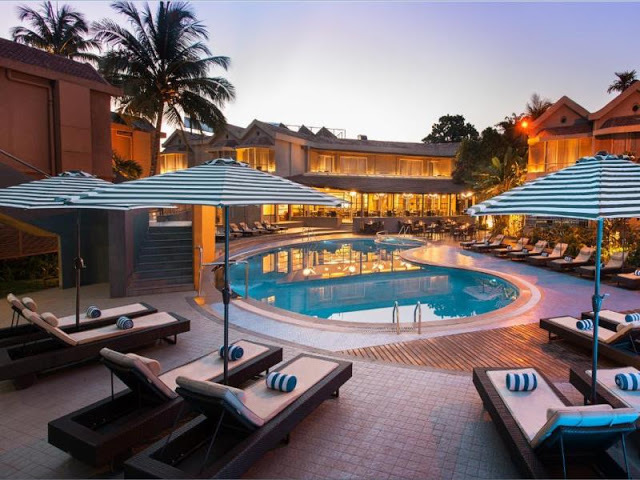 It provides accommodation, visitor chalets, restaurants, conference hall, recreational equipment, sunbathmg sites and is known for its ensemble of cultural entertamers thrilling visitors to various cultural treats durmg holidays and weekends. The significance of the palace of the Sultan of Sokoto goes beyond cultural and artistic excellence; the palace is also the cohesive symbol of the Nigerian muslim world which guides believers in the faith. 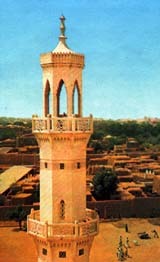 It is located in Sokoto town, the capital of Sokoto State . Othman Dan Fodio has a significant place in the history of Nigeria as a famous Jihadist credited with the spread of Islam in the North and beyond. His tomb in Sokoto has remained an attraction. Gashaka/Gumpti Game Reserve: This Reserve parades the largest and richest reserve South of the Sahara. It contains various Flora and Fauna with varied bird viewing possibilities. Gashaka/Gumpti Game Reserve is in Taraba State. The Mambilla Plateau:This is a Plateau of about 1,830 metres above sea level. It has temperate climate within the tropical region. It has an undulating landscape free of insects. Temperate crops like the avogad's pear, Straw berries. Coffee arc grown there. The popular Mambilla Tourist Centre is located at Gembu in the high land. Biu Plateau:Yoke State, predominantly hot region has the Biu Plateau as a special attraction because of its temperate climate. The weather condition within the Biu Plateau area is comparable to that experienced around the Jos Plateau in Plateau State.Gorges and escapments are also there on the Plateau for sightseeing. Among the escapments, Miringa and Marama are popular.